I get a lot of email. Some of it I even respond to. A lot of it I would like to respond to it, or follow up on it in some way at some point in time, just not immediately. I don't have all of my email being dumped into a single folder, and I use multiple email accounts too. What do I do? So what have I done? Lets start with the first item. 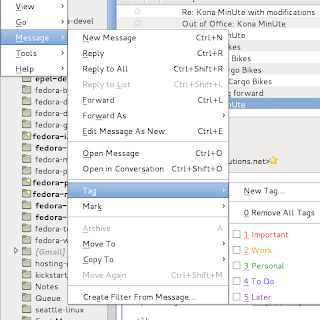 Thunderbird has a multitude of ways to mark messages. First, I could just leave the mail unread. That's a pretty good indication that something needs to be done. But I'm a tad OCD and I really dislike there being unread messages in my important folders. 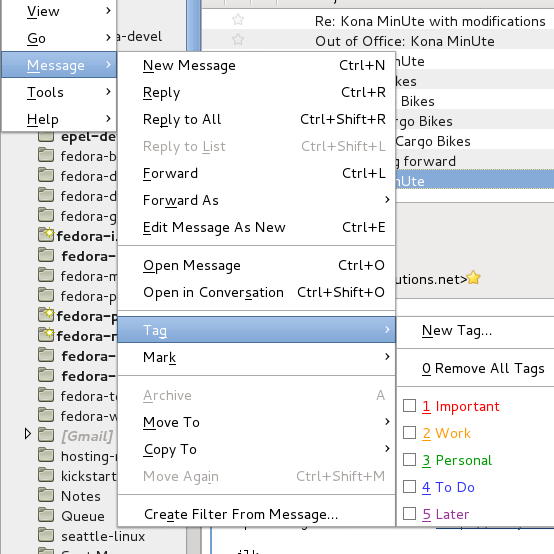 Next Thunderbird has this concept of Tags. It provides you with a bunch of default tags, and a way to add more. 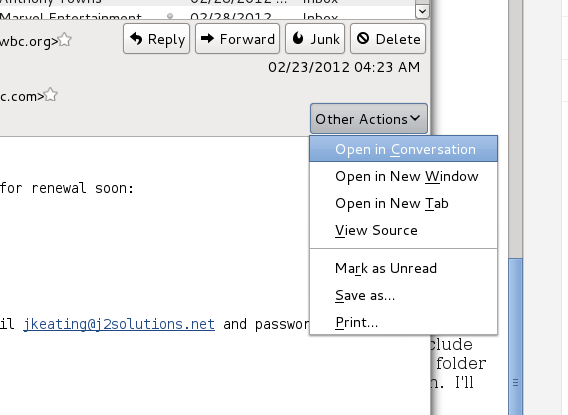 Tags kinda work, but an IMAP server might not support them, and thus you wouldn't be able to share tags across clients. The next option is marking a message as "Starred". A star seems to be well supported by IMAP servers, and across the clients I was playing with. This solves the "Mark messages for follow up" problem. 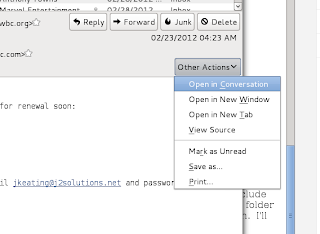 Thunderbird conveniently has a keyboard short cut, 's', to toggle a message's starred state. The next requirement was getting a quick look at the things I needed to follow up on. 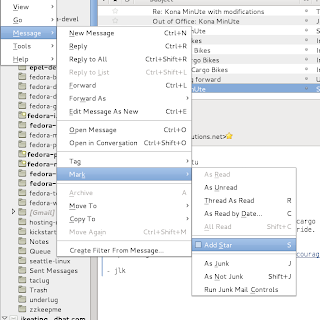 Thunderbird can search your messages, and you can include the starred state in the query. Further, you can save your search as a folder for convenient access. See this article for how to setup a saved search. I'll spare you the details here. Now that I've got a folder I can click on to see what needs to be followed up on, I need to get context for those messages. Right now I'm just looking at a flat list of starred messages, no thread details. Enter a lovely feature: "Open in Conversation". This is an extremely useful feature for me. Not only will it open up a new tab (which is awesome by the way), it'll populate that tab with a threaded view of all the mails related to that starred mail. 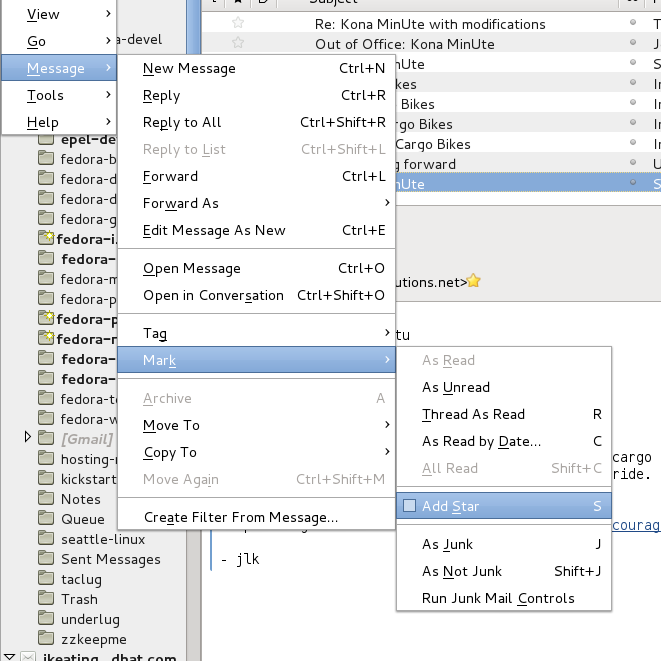 All the mails. That includes my own replies. In a multi-pronged thread with multiple participants, one can quickly lose context as to what's been replied to and what hasn't. Being able to see my own replies intermixed with the rest of the thread is pretty awesome. Now, if you're following along at home and have noticed that your "Open in Conversation" menu entry is greyed out, fear not! 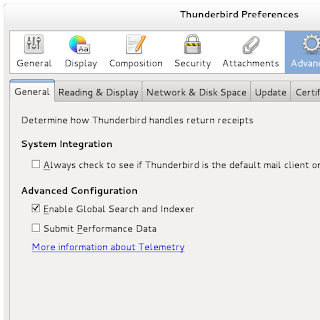 This feature depends on the "Global Search and Indexer" being enabled. 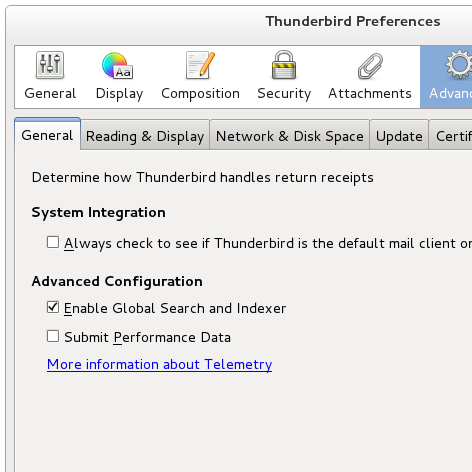 If this isn't enabled, enabling it will spike your CPU for a bit as TB gathers information about all your mail. After that initial hit, I haven't noticed any performance overhead. So that's how I stay on top of my email. It keeps me efficient, and lessens the likelihood of something falling through the cracks. A friend who's been a TB user for years wasn't aware of this feature and after describing it to him I realized other people might not be aware, so here ya go! Excuse me a moment whilst I rock out to a killer electronic drum riff. I've had a Macbook Air for a while now, not the original air, but the first redesign of it (sadly just before they did another redesign with a better chipset and backlit keyboard, oh well). When I first got it, I went a little crazy, and setup a triple boot system, OS X, Windows (Vista), and Fedora. Sadly, Fedora didn't work so hot. There were graphics issues, sound issues, touchpad issues, wireless issues, I mean, I think the issues had issues. So instead of fighting all those issues, I did something even more silly. I found a virt software set in OSX that would allow me to attach a real partition to the guest. I setup a virtual disk image to do a minimal install of Fedora in, then edited the grub config so that it would actually load up the real disk partition as /. This actually worked, surprisingly well. I spent most the time in OSX with various X11 applications ran through ssh, and of course ssh'd into the guest to do all my command line work. It still felt dirty though. I would also let the guest boot up into graphical mode and make that go full screen in OSX Lion, which gave the illusion of using Linux native on the hardware. The upside was that the touchpad worked pretty well, and there weren't network issues. Video still sucked, no gnome-shell for me. When I picked out the Air, I was thinking that it would be nice to have some hardware that was not the normal around the water cooler, so that we had a broader set of systems being used every day. I actually thought I could do something to fix issues that came up. Ha, hah. Turns out the most useful thing I could do was hand the system off to people who knew what they were doing. Enter Super Hero mjg who decided (or got tasked with, I'm not sure which) that making Fedora work on Apple hardware like my Air was a thing he would do. And he sure did! That's the Fedora 17 Final (RC3) Desktop Live image being installed to my Air. It couldn't have been easier. dd the iso to a USB stick, boot holding down option, plug in the stick (because I forgot to do that first) and pick the Fedora Media. Anaconda did all the right things (even when I didn't) and I now have a simple dual booting macbook. F17 looks awesome. First time I've really used shell, and I like it. Audio works, graphics work, webcam works, touch pad (mostly) works, even the brightness and volume buttons work. I can't wait to haul it down to my local Starbucks on my bike, then show it off to my hipster friends, because you see, I was using Fedora on my Air before it was cool. It has been a few years since I was last heavily interested in how Anaconda did it's things. Having recently gotten back into it for my new role, it's kinda cool to see how much has changed. Too much really to list here, I'm still trying to get a grip on it, and it's all changing again! So I've had a fun few weeks getting used to the new way of doing things, stumbling around, mumbling about "In my day!" and waiving my cane. The reality is that these are all really cool improvements, and it's made working on changes quite a lot easier to manage. I don't like that feeling that the world has moved on while I wasn't looking, but then again, that's OK, that's what the world should do. I just get to be that New Guy again for a bit.